With the highly anticipated Gilmore Girls revival coming out this Friday, we thought we would take a look at a few things Rory would be doing if she attended Yale in the year 2016. 1. Go to a local coffee shop. Gilmore Girls was all about the coffee. While attending Yale, we saw Rory stop at a lot of coffee carts on campus. However, 2016 New Haven has plenty of local coffee shops she could get her coffee fix at too including Koffee? and Book Trader Cafe. 2. Go see a musical at Yale Repertory Theatre. Miss Patty’s musical review did include “Magic to Do”from Pippin, but Rory never got to experience that performance. If she was at Yale today, we’re positive she would be attending a show at Yale Repertory Theatre. 3. Check out an art gallery. We all remember the festival of living art. If it ever comes to New Haven, Rory should be ready. She can check out one of the many museums at Yale or around New Haven including the Yale University Art Gallery or the New Haven Museum and Historical Society. 4. Find a good outdoor study spot. 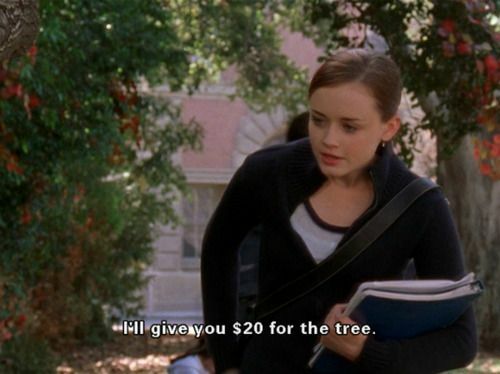 Rory and Lorelai were never the outdoorsy type, however, Rory did find her one good study tree during finals. New Haven has plenty of gardens and parks Rory could be exploring to get that peaceful and serene environment she is looking for, including the Kouros Gallery Sculpture Garden or the David Hayes Sculpture Fields. 5. See a play at Long Wharf Theatre. Rory can be a tough critic, as displayed by the time she had to review the ballet. But if Rory were at Yale now, we think she would have enjoyed the fast-talking production of Other People’s Money playing at the Long Wharf Theatre. 6. Take a trip into New York City. When Rory skipped school to go visit Jess in the Big Apple, the day didn’t end too well. Rory deserves to see more of the bright lights of the city, so we think she’d enjoy exploring the museums, seeing a Broadway show, and discovering all that the city has to offer. 7. Eat at an Emily and Richard approved restaurant. Emily and Richard Gilmore had some extremely high standards, including food. When the two alum would go to visit their granddaughter, they would want to go to a nice, upscale restaurant with great food and atmosphere. In 2016, Rory could take them for a nice French meal at the Union League Cafe or maybe a more modern Italian cuisine at L’Orcio. What do you think Rory would get up to in 2016? Tweet us or let us know on Facebook!